Depreciation is a hell of a drug. Today's Nice Price or Crack Pipe Mercedes S600 once was the marque's range-topper, but oh how the mighty have fallen.You'll just need to decide if it's fallen enough. I like popping the hood on a little car and finding a turbo set up where the snail's as big as the mill itself, I think that's a hoot. It's funny in the manner of a little dog with great big balls. Not so funny was yesterday's 1974 Toyota Corolla with just such a set up. There always have to be exceptions to any rule, you know. That car, while tidy in outward appearance simply left too many questions unanswered in its ad, and the big one for 90% of you was why the eff is the seller asking fourteen-five for it? Today we're going to look at a candidate that's at the opposite end of the spectrum from that Corolla, both in stature and in price. The Mercedes has for decades been the ultimate expression of the automotive form. These range-topping models may have traditionally been positioned to compete with BMW's 7-series and the Jag XJ, but truth be told those cars were typically a generation behind the big Benz when it comes to features, technology, or panache, the Jag perhaps two or three generations back before Tata bought them. The W140 series was a prime example of this attempt to top all other car makers' wares taking a decade to develop at a cost to the company of nearly a billion bucks. One of the reasons that Mercedes took so long baking the big Benz was the desire to introduce in this model a new 6-litre V12 powerhouse. The M120 served as the top dog in the W140 as well as the basis for the screaming banshee that powered the Pagani Zoinks! In today's 1994 S600 Coupe, it pumps out 389-ponies, as well as about 420 lb-ft of twist. At least those are the specs. For comparison, the contemporary Ferrari 512tr managed 421-bhp out of its 5-litres of 12-cylinder goodness. The W140 was the first V12 coupe ever offered by Mercedes Benz, and upon their debut in 1992 they went by the marque's traditional naming convention with the displacement expressed in hundreds and then the letters that described the car. The 12 was the 600 SEC - 6-litre, S-class, Extremely Competent. Just kidding about the last bit, it really meant Extraordinarily Costly. This white knight, being a '94, goes by the revised naming structure which anoints it the simpler S600 explaining class and engine size, again in hundred format. The car itself is fully up to the engine, exhibiting all the presence and gravitas you would expect from a big German coupe. This one is claimed to be all-original and to have every option short of a butler and bidet, and amazingly, it's all said to work! That's been the downside to the big Benz being the vanguard of automotive technology, as packing the cars full of cutting edge features means that inevitably a few of them are going to prove unreliable. From the detail in the ad, this 110,000 mile machine has dodged a lot of those bullets. It does have a fairly new battery, thermostat, and an engine harness that the seller says was replaced as it's a known issue. The interior, in grey leather and burlwood, looks nicer than my house, and there seems to be very little wear on the parts you touch. Another plus is that this is a pillar-less design, the double-wall glass going down both front and back (no rim-job jokes, please) and I think these have those cool robot arms to serve you your seatbelt. Hmm, that means it does have a butler so i'd start looking for the bidet. The 12-cylinder W140 is a freight train of a car. I would wager that you couldn't come close to its sense of solidity and security outside of something with BRINKS on the door. These also go through premium gas like a frat party goes through roofies, the S600 being one of history's greatest odes to OPEC. But the discriminating buyer expects that, right? And after all, at $133,000 1994 dollars - about $212,000 today - filling up even a couple of times a week isn't a big deal. Of course this S600 no longer commands six figures, and in fact this one's asking price is well below what even the most cut-rate new car presently commands. This one could be yours for $5,000, a far cry from its original price when new, and seemingly a lot of car for the money. Or is it? What do you think about this MB for five-gees? Is that a deal based on the ad's description and the car as presented? 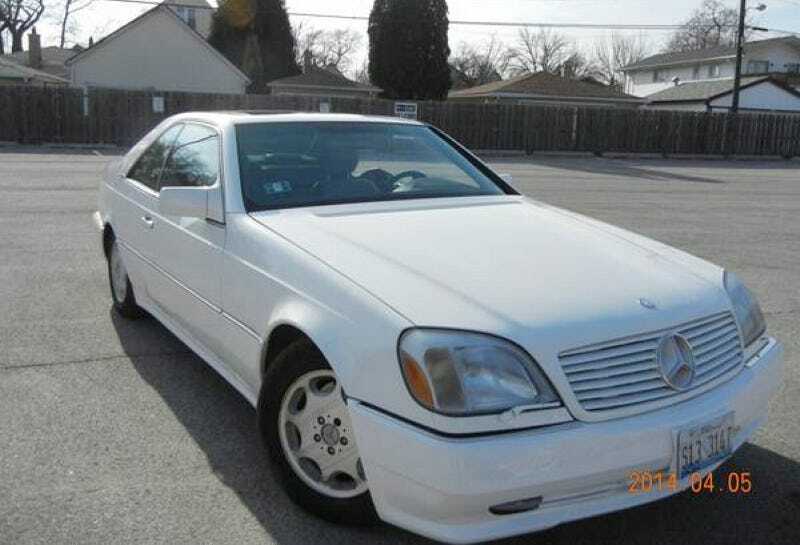 Or, does this S600 need to undergo some more depreciation before you can advise its appreciation? Chi-Town Craigslist, or go here if the ad disappears. H/T to lurker Will for the hookup!